The area roof sign stickers were rolled out for Dublin on 1 December 2010 and on the 4th May 2011 for the remainder of the country. These small reflective stickers, identifying the county in which SPSV (taxi) drivers are licensed to stand or ply for hire, were introduced as a response to requests made by industry representative groups, and following consultation with the Advisory Council and An Garda Síochána. 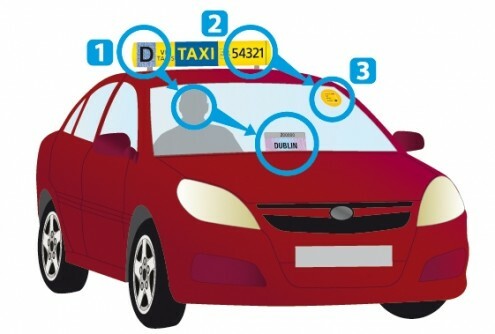 The National Transport Authority is enhancing the requirements for taxi roof signs to make it easier for both consumers and enforcement officers to check that the driver of a vehicle is licensed to stand or ply for hire in the area. Under the new regulations, the roof sign must include a one- or two-letter code to indicate the county in which the driver is licensed to operate. The code is shown on a special area sticker affixed to the roof sign. All taxi and wheelchair-accessible taxi drivers are required to have this area sticker on their roof sign from 1 August 2011. Failure to do so will be an offense, leaving the driver liable to prosecution with a maximum fine of €2,500. Please note that the driver ID card continues to be the primary means of confirming the status of the licence and driver details. The stickers are resistant to rain and sunlight. If placed correctly they should last a minimum of two years. Stickers contain a PVC-based security film, making them tamper-proof – they cannot be removed and successfully applied to another roof sign. Standard Taxi Roof Sign carries the Driver County Identification sticker. This indicates which county the driver is licensed to ply or stand for hire. Standard Taxi Roof Sign carries the Vehicle Licence Number and is displayed on the front and back of the roof sign. Tamper Proof Licence Disc appears on the front and rear windows. These discs specify the vehicle licence number, the vehicle registration number, how many passengers the vehicle is licensed to carry and the vehicle licence expiry date. Driver ID card. This card must be clearly displayed in the dashboard of the vehicle. This card shows the name, driver licence number, the expiry date of the driver licence and the area in which the taxi can ply or stand for hire. When affixing the area sticker to your roof sign, the positioning is crucial. On the front of the roof sign, the sticker should appear to the far left of panel to the left of the central panel. To clarify, this is the panel in which you might display driver or dispatch operator details, not the panel containing the vehicle licence details. On the rear of the roof sign, the sticker should be placed to the far right of the panel to the right of the central panel. If your roof sign is different to the image, please note that in all cases the sticker should be placed in the panel that does not contain the vehicle licence number.